The Sumo Junior Evaportive Cooler is intended for cooling people where there is plenty of fresh air ventilation. It is designed for use in marquees, factories and warehouses where large areas with high air change rates make it impractical to cool the whole area with refrigerant based air conditioning systems. As a general guide a single evaporative cooling unit will cool an area of around 30 sq mt. Water is added to the unit and it is the evaporation of that water into the air stream from the fan which gives a cool air flow. 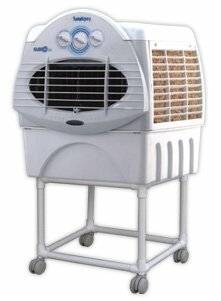 Evaporative coolers are not intended for office use. Where adequate ventilation at each end of a room is available to ensure a free flow of air then these units can be used as the moisture will be vented away.